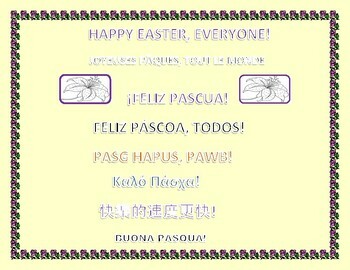 HAPPY EASTER SIGN IN 8 LANGUAGES: USE FOR DOOR, HALLWAY & BULLETIN BOARDS! This Happy Easter sign is in 8 languages. Use it for hallway, door, or bulletin board. It has a white lily on each side, a flower symbol for Easter.